Tanna of the fourth and fifth generations (second century). He was second among the five learned sons of Jose b. Ḥalafta (Shab. 118b; Yer. Yeb. i. 2b); and the father repeatedly reports opinions which he had heard from Eleazar (Sifre, Deut. 148; Pes. 117a; Yoma 67a), while the latter transmits halakot in his father's name (Men. 54b; Pesiḳ. i. 4a). 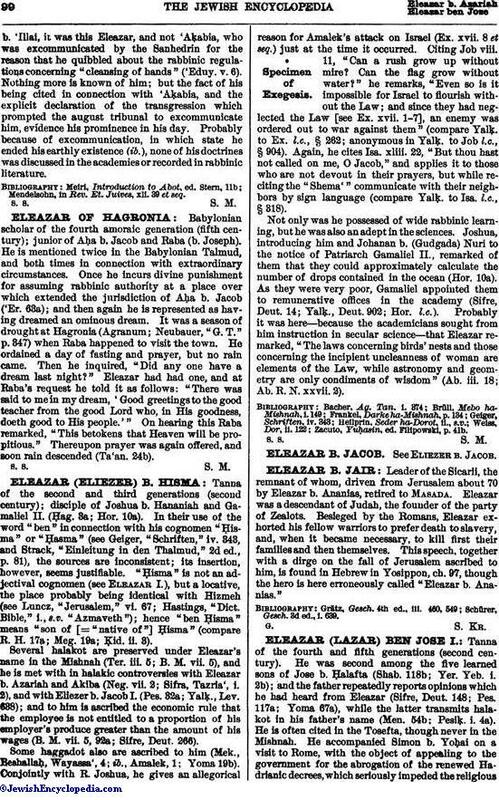 He is often cited in the Tosefta, though never in the Mishnah. He accompanied Simon b. Yoḥai on a visit to Rome, with the object of appealing to the government for the abrogation of the renewed Hadrianic decrees, which seriously impeded the religiouslife of the Jews. On the way Eleazar was attacked by a dangerous illness, but he recovered and proceeded on the journey (Me'i. 17b; see Rashi). The mission was successful (Me'i 17a et seq. 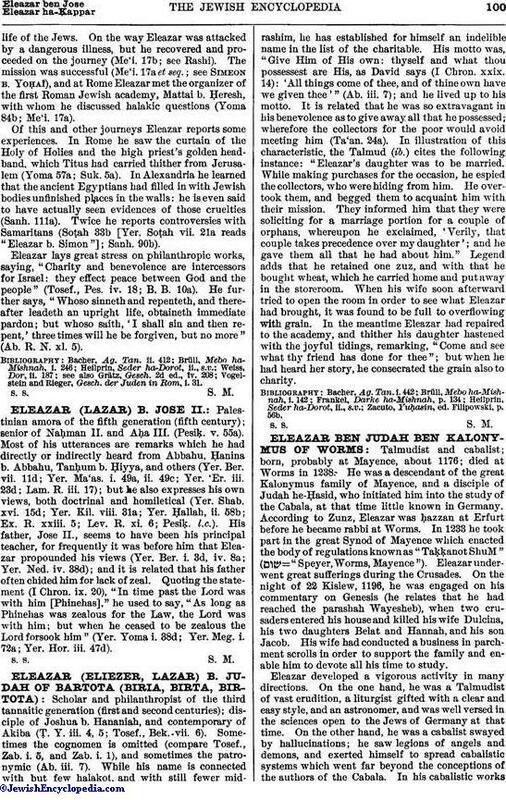 ; see Simeon b. Yoḥai), and at Rome Eleazar met the organizer of the first Roman Jewish academy, Mattai b. Ḥeresh, with whom he discussed halakic questions (Yoma 84b; Me'i. 17a). Of this and other journeys Eleazar reports some experiences. In Rome he saw the curtain of the Holy of Holies and the high priest's golden headband, which Titus had carried thither from Jerusalem (Yoma 57a; Suk. 5a). In Alexandria he learned that the ancient Egyptians had filled in with Jewish bodies unfinished places in the walls: he is even said to have actually seen evidences of those cruelties (Sanh. 111a). Twice he reports controversies with Samaritans (Soṭah 33b [Yer. Soṭah vii. 21a reads "Eleazar b. Simon"]; Sanh. 90b). Eleazar lays great stress on philanthropic works, saying, "Charity and benevolence are intercessors for Israel: they effect peace between God and the people" (Tosef., Pes. iv. 18; B. B. 10a). He further says, "Whoso sinneth and repenteth, and thereafter leadeth an upright life, obtaineth immediate pardon; but whoso saith, 'I shall sin and then repent,' three times will he be forgiven, but no more" (Ab. R. N. xl. 5).